The Ministry of the Interior created the Police Commando Battalions on self-initiative in order to provide immediate strike force capability. Initially stood up in August 2004, two battalions of highly vetted Iraqi officers and rank-and-file servicemen were operational within two weeks and performed with great distinction in anti-Iraqi force counter-operations in Haifa Street and Al Monsour in Baghdad, North Babil, and Samarra - four insurgent hotspots. The force - still comprised of two operational battalions - as of October 2004 has a third battalion in training with a fourth and fifth recruited the week before that was yet to undergo initial training. The force, through recruiting prior service professionals, however, was designed for immediate employ, putting to work personnel from the former regime's Special Forces elements and other specialty units. Ministry of Interior Security Advisor, Iraqi Police Service, Maj. Gen. Adnon Thabit, the architect of the force, personally interviews all officers and commanders for the unit he describes as one focused primarily on building raid operations, counterterrorist missions including anti-airplane hijacker, anti-kidnapping and other similar missions. And according to his multinational force counterpart, U.S. Army Col. James H. Coffman, Jr., a special advisor from the Multinational Security Transition Command - Iraq, the process is an ongoing one aimed at making the unit highly effective. The force resembles more a paramilitary army-type force complete with heavy weapons, rocket-propelled grenades, AK-47 assault rifles, mortars, and 9mm Glock pistol issues. The force stood at nearly 4,000 personnel including recruits as of October 2004. As of June 2005, there were over 8,000 trained Special Police Commandos on duty. Special Police Commando recruits, who typically are seasoned military veterans, receive training for three weeks within their units concentrating on individual weapons instruction and light infantry tactics; they receive no police training. Training has been conducted for the most part at their bases, but the Coalition has just completed a new four-week basic training academy for new recruits; the first class of 97 students graduated on June 23, 2005 . Subsequent classes are planned for 250 students. The program of instruction includes training in basic marksmanship, medical first aid training, tactics training, land navigation training, and drill and ceremony. Members of the Special Police Commandos are recruited by the MOI. 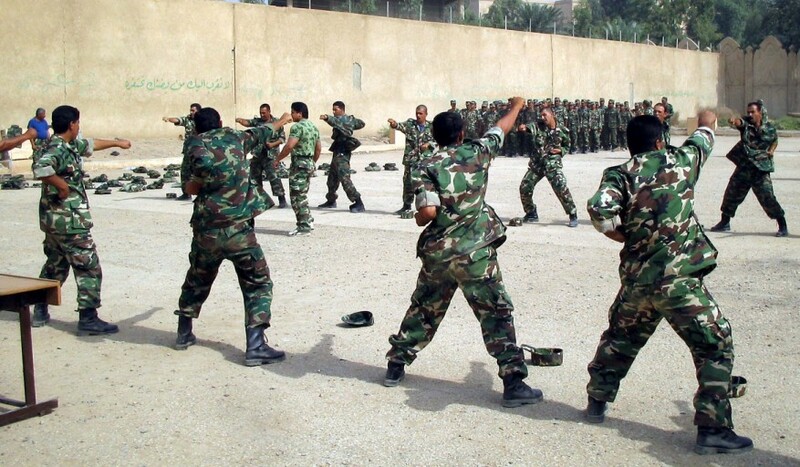 Individuals are screened by the Commandos’ chain of command with emphasis on non-sectarian and non-political loyalty to the country and government of Iraq . Individuals are also screened by the Qualifying Committee to insure that no recruit is inducted who has a criminal record or a history of participation in terrorist activities. The Special Police Commandos’ equipment is non-U.S. in origin with the exception of the primary tactical vehicles. Small arms and crew-served are principally Eastern-bloc AK -47s, rocket-propelled grenades (RPGs), and RPK and PKM light machine guns. The Special Police Commandos are also equipped with Glock pistols. Most organizational clothing and individual equipment is manufactured in Iraq . The Special Police Commandos are scheduled to receive 60 ten-passenger armored cars. The training goals for the Special Police Commandos include: conducting training at individual, leader, staff, and collective level; and continuing to develop a mission-essential task list including conducting a raid, conducting cordon and search, and defending a fixed site. The equipment goal is for each unit to have at least 70 percent of its authorized equipment by October 2005. Although exact rates of absenteeism, AWOL, attrition, and desertion are unknown, the overall rate of loss of personnel from these categories is below 10 percent. The extent of insurgent infiltration is low based on the chain of commands’ direct involvement in recruiting and the Qualifying Committee’s process to screen potential members of the Special Police Commandos. The Special Police Commando chain of command is assessed as highly effective.